Joie Grandbois: Creatrix: A week of waste..
Two things happened this past week. First I found this article on the Zero Waste Movment on the How Stuff Works website which got me to thinking about how much waste I actually generate. The second thing was an essay I began writing on the three pillars of sustainability (economic, environmental, and social) and how these three principles apply to the body and personal sustainability. I'll be sharing more on the subject of sustainability as it applies to an embodied life in later blog posts. Because of these two things I began to recognize that while I recycle, compost, and try to make fairly good choices when I buy things, I really had no idea of the amount of actual waste I generate. I began to notice that the tea I like to drink not only has the teabag but also a little envelope for the bag, and of course the box the bags all come in. 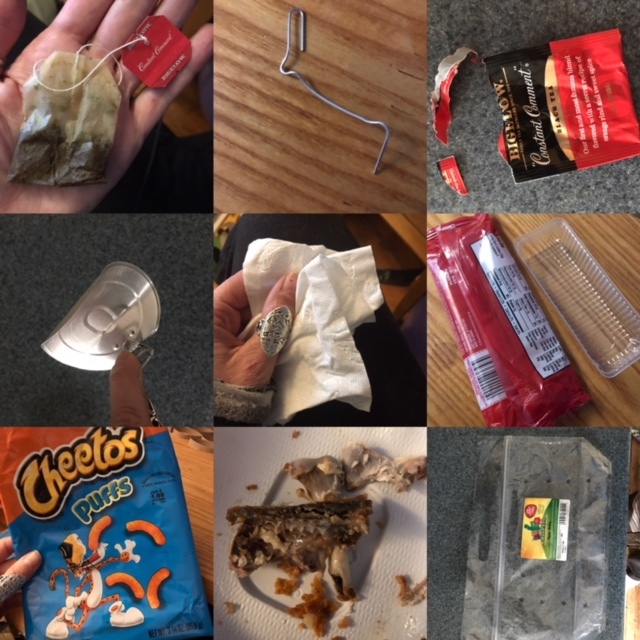 I recognized how many tiny bits of plastic are used to make safety seals, and that I really did forget to bring my bags to the grocery store more often than I realized. I recognized that I likely create more waste than I previously thought. So I've decided that for one week, starting today, I would track all of it. For the next week I will take a picture of every piece of waste I generate in a day; all of it - even the compostable and recyclable bits. The next morning I'll share a photo collage of the prior days waste, plus some thoughts here and on Instagram. These will also be cross posted to Twitter and Facebook. I've already noticed a few things today - I use a lot of toilet paper and there is more plastic in my life than I realized. I also toss things away without much thought. There are many little bits of trash that I just don't even notice anymore, they have just become a part of life. Despite this I'm doing my best to not change my current habits during this week. This project is first about learning just how much trash I actually generate, the next step will be doing something about it. I also realized just how personal ones trash is. That by sharing every bit of waste that I generate, I'm sharing a lot of information about where that waste comes from and my personal life habits (like my weekend indulgence in junk food and how much coffee I drink per day). This will also be an exercise in honesty. So stay tuned the first day's waste will be posted in the morning! You are very courageous! I am frightened to know how much waste I generate. Thank you for doing this and sharing. I definitely need to face the truth...hopefully very soon. Thank you Tina! It has been interesting and thought provoking. I will be sharing what I learned from this week in a future post. What does "here" mean to me? Week of Waste Day 5: What next? 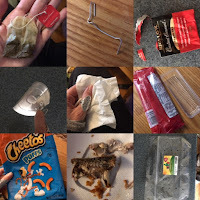 A Week of Waste: Day 2 - Where does it all go?